Voyages to Atlantean outposts are a type of Sea Monster Hunt, and can be found on all oceans. 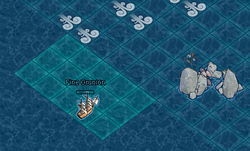 Here, player ships may battle sea monsters in a multi-way sea battle; after defeating a monster, a ship may haul the resulting spots for PoE and chests. Additional rewards can also be had by raiding citadels. All Atlantean outpost battles are sinking, as with other types of Sea Monster Hunts. In the weeks leading up to the Atlantis release on the Ice Ocean, Antediluvian Pillars were discovered across all 5 production oceans. Beginning on August 3, 2007, antediluvian conch artifacts were released in tournaments and bake-offs. Anyone holding an antediluvian conch artifact on August 16, 2007, was granted a map to Atlantis on Ice, giving them the initial first-hand looks at the new feature. Maps to the Atlantean outposts are in the form of special charts, which can be obtained by winning sea battles during a pillage, by defeating skellies, zombies, or werewolves, or as a random reward from black boxes. These maps can be traded between players as normal. They mark a route between an island and a unique league point, which are similar to flotilla league point markers, except that they cannot be memorized. To chart an Atlantean course, the map must be placed on the ship's navigation table. Maps are "locked" to the navigation table while a route is charted to the sea monster league point. Also, there is an Atlantean voyage configuration. Once the vessel safely reaches port, the charted course can be cleared and the map can be reclaimed by any officer. To set sail to Atlantis, all pirates aboard must either hold a bravery badge or be subscribed. On the Dark Seas, a badge is not required to participate. 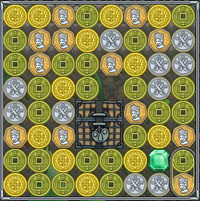 Upon entering the sea battle board, a vessel will start in an entrance zone to the top-right or bottom-left of the board. 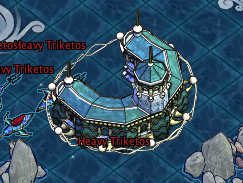 Treasure Haul sites can be found on the Atlantean Attack board, marked by the masts of sunken ships. The puzzle is played as normal, except for the addition of a 2x2 chest. If the chest piece is cleared to the top of the Treasure Haul board, a treasure chest is transferred to the Booty and its contents will be distributed to the players during booty division. The chests have either one, two, or three padlocks, with 3-lock chests (called Antediluvian chests) providing the best booty. At any time in an Atlantis outpost battle, Atlantean dragoons may board a player's ship. The rate at which dragoons board the ship is increasing with its size and by not using movement tokens. These dragoons will challenge players aboard to a swordfight, which will include a new piece, the aqua trident. If the players win, the dragoon will exit the ship. However, if the player loses, the dragoon will remain aboard and attempt to take over the vessel. Additional dragoons will board over time, up to the number of players aboard the ship. If the number of Dragoons equals or exceeds the number of players aboard the ship, everyone on board receives a message reading: "Arr! Those pesky Dragoons be wanting yer ship! All hands join the fight to save the vessel! ", and automatically enter a swordfight, which includes the new aqua trident piece. If the players win, the Dragoons leave. However, if the Dragoons win, they take over the ship and throw the players overboard. All effects take place as if the vessel had been sunk. Another challenge of Atlantis is to sink or avoid the sea monsters which spawn throughout the board. They will attempt to sink or trap player ships, preventing the players from hauling treasure or defend against dragoons. Because of these monsters, pirates commonly call voyages to Atlantean outposts Sea Monster Hunts, or SMH for short. A trike board is an Atlantis board where the dominant monster battled is a triketos. Atlantean command citadels will sometimes rise from beneath the surface to coordinate an attack. If no ships enter the citadel within 25 turns of it rising, it will dive beneath the surface again. If a ship is navigated into the U shaped building, it will be protected from attacks from outside, and will be thrown into a ship wide swordfight fray which also uses the new trident piece. If the citadel is defeated, treasure chests of varying quality are awarded to the ship and the citadel dives beneath the surface leaving the ship to defend itself against the waiting sea monsters. If the ship loses the citadel simply dives without giving any reward. Upon entering the Citadel, all players aboard the ship get a message saying, "All hands join in the fight to defeat the strangers and loot their treasure." Certain clothing items, trinkets, furniture items, and injuries can only be obtained during a Sea Monster Hunt in Atlantis. On rare occasions, pets and familiars are awarded. Some of these items are given out in the hauled treasure chests and some are given upon the ship sinking. In addition to being able to obtain numerous standard clothing items in the Atlantis-exclusive color Atlantean, Atlantean helmets in both male and female are given out as prize items from the hauled treasure chests. These are just a few examples. It is also possible to win an atlantean chroma, which may be used to change a single color on a single item of clothing to atlantean. An Ippolito perched on Wazzy. As of release 2008-02-05, pirates could receive an Atlantean species of familiar called "Ippolito". This familiar is only found in Atlantis, and pirates may receive one during booty division of treasure chests. They are available in seven known colors: aqua, atlantean, black, blue, light blue, navy and white. Certain Atlantean themed furniture items can only be obtained from treasure chests in Atlantis. The injury in a portrait. As of release 2008-02-05, a new injury exclusive to Atlantis became available upon sinking while on a Sea Monster Hunt: a starfish clinging to the pirate's face. This "injury" is available for use in portraits and may be removed by a potion from the apothecary. As of release 2008-02-05, pirates could receive an Atlantean species of crab called "Karkinos". This pet is only found in Atlantis, and pirates may receive one during booty division of Treasure chests. They can come in any of the four shades of blue, with gold, silver or bronze filigree. Atlantean-themed trinkets and standard trinkets in the Atlantean color palette are available from treasure chests. Starting with the July 2007 PoEmail, hints about Atlantis were given out. On August 16th 2007, Atlantis was released on the Ice Ocean with blacked-out art and preliminary conditions for testing. When Atlantis was first tested on the Atlantis Outposts release, the Sea Monster AI was extremely weak, resulting in less challenge for those who got their maps and went to it at 11AM pirate time. Atlantean AI was fixed along with other bugs later that day with the Secret of the Ooze release. Many players tested and reported about Atlantis, as a result of this the next day the Son of The Mask release was issued along with an unnamed release. Atlantis continued to be modified when an unnamed release and the Here there be dragoons release came out; dated August the 23rd and the 24th respectively. Atlantis was released on to the production oceans on September 4th, 2007 under the release known as Release_2007-09-04. In release 2009-05-27, Atlantis maps were given new images to distinguish them from Cursed Isles maps and regular charts. Also, the Atlantean princess statue was renamed to Atlantean priestess statue. This page was last modified on 23 September 2017, at 23:00.